Getting your eight glasses of water a day doesn't have to be dull. 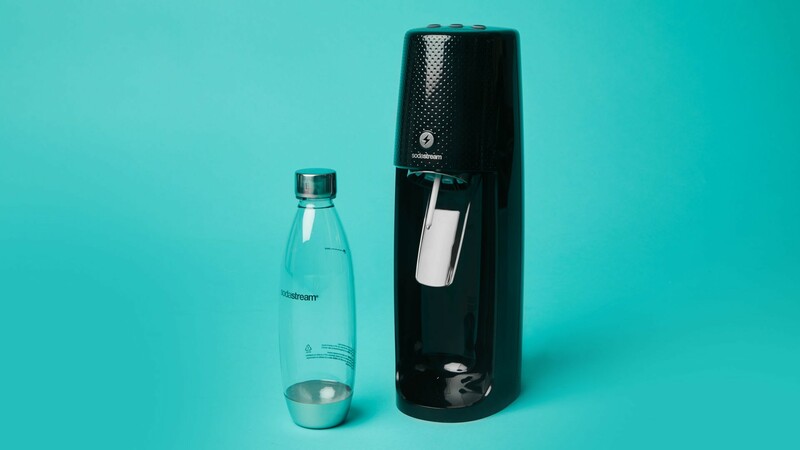 SodaStream's latest model creates sodas and seltzers at the touch of a button with three carbonation settings. Truth be told, we could probably all do with drinking more water. But pitted against more flavourful juices or mood-enhancing caffeinated beverages, water often pales in comparison and getting our 8-glasses-a-day falls by the wayside. One way to make water more interesting is with a SodaStream, which carbonates your H20 by adding carbon dioxide to create soda water. You can also add syrups and concentrates to your water to create a flavoured sparkling beverage. SodaStream recommends that you only use water in their machines – but we won't tell if you want to experiment with other libations in the privacy of your own home. The internet is awash with recipes for creating cocktails and even champagne (whizz up some wine and voila – bubbly!) But we recommend going gently, starting on the lowest setting and maybe having towels on hand in case of a spillage. If you've been waiting to purchase a SodaStream, now might be the perfect time to take the plunge. Fizzi One Touch, the latest model in the SodaStream range, allows you to automatically turn your water into sparkling water with (as the name implies) the touch of a button. There are three carbonation settings, so you can choose how much you want to whizz up your seltzer. SodaStream Fizzi One Touch is even sleeker than its predecessors, meaning it won't eat into your precious kitchen counter space.